Greetings to all my beloved Orthodox Christians. I am Fr. Barnabas from Labasa, the second largest island in Fiji. I am taking the opportunity to convey to you how I found the truth in the Orthodox Church. 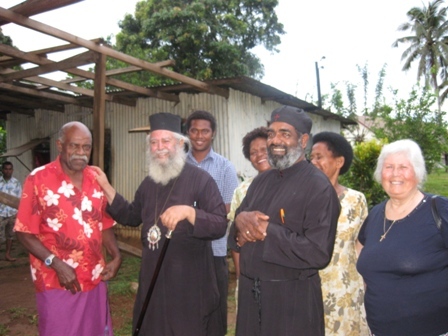 When I first met His Eminence Mr. Amphilochios on my island Vanua Levu in the city of Savusavu it was a Saturday morning on the 18th of June in 2010. When he visited me in my store, he was standing near my door. I thought he was an ordinary man, but then I saw that he wore a pectoral cross of our Lord Jesus Christ. I took him into my shop. I was very happy and my tears were rolling when I shook hands with him. With his smiling face he called me outside and we had a pleasant conversation. I managed to meet him again the next Sunday. It was the only time for me to pray with a holy man, I, who up until then was a very strong Hindu and did not want to become a Christian. One evening I invited him to my home to have dinner and to meet my family. Throughout my life being a Hindu no one ever visited my family. But that which His Eminence did by visiting me, despite me not being a Christian, was an emotional moment for me and left me speechless. We had some discussions and later he asked me if I wanted to change my faith and become an Orthodox Christian. Something that I easily noticed was that he was a man full of love and true faith. Later he took me and my family to Greece, and then I was ordained a deacon in Rhodes in the Monastery of Panagia Ipseni. We came to know what Orthodoxy is. It is a true faith and today I feel proud that I am an Orthodox Christian. When I see churches and monasteries, tears fall from my eyes and I thank our Lord and Savior Jesus Christ, who changed our life into Orthodox Christians. Then after a week I was ordained a priest in the Church of Saint Gregory Palamas in Thessaloniki. It was a great day for my family and for the people of my island of Vanua Levu. In my life I never thought I would become an Orthodox priest and I am very proud and want to thank our Lord Jesus Christ. 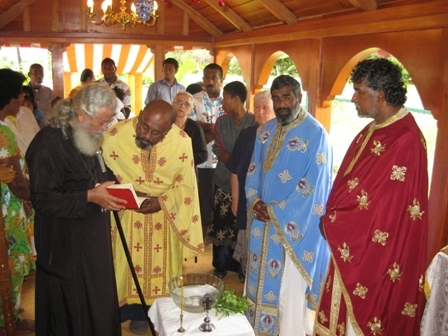 I assure you that with the help of God and the blessing of His Eminence Amphilochios I will bring in many Orthodox Christians on my island, in the Church of Saint Athanasius and Saint Nicholas in Vanua Levu. The grace of our God and His infinite mercy be with you. I want to thank His Eminence Archbishop Amphilochios for my ordination to the diaconate, as well as the nuns and fathers of the monastery in Tharri of Rhodes. I would also like to give my heartfelt thanks to the residents of Rhodes for the care and love shown us during our stay on the island. Finally, I want to thank the people of the Orthodox Brotherhood of Foreign Missions in Thessaloniki for their great support during my ordination and throughout the entire duration of my stay there.